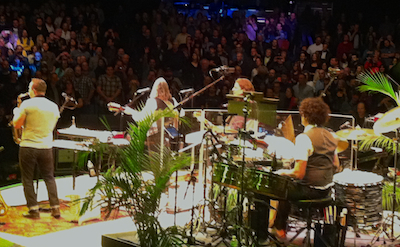 What a show tonight in Westbury, NY at the NYCB Theatre at Westbury! A venue "in the round" with fantastic acoustics and the audience loved the warm, intimate ambience. Roger performed his "Babaji" tonight, and the crowd responded with a standing ovation to this not-often-played gem - http://www.youtube.com/watch?v=glWGN5mTWuM. In fact, there were no fewer than nine standing ovations during the show tonight, plus ovations when Roger came on the stage and at the end of the show! Each and every song was greeted with such enthusiasm and emotion. Thank you, New York, for your hospitality, and we certainly hope to be back! It was wonderful to see fans from our International Community meeting in New York tonight! In the audience were fans from Texas, California, Florida, Washington, DC, Portugal, Brazil, and all over the Northeast US! Join us in New Jersey! Next stop on the Breakfast in America Tour is Collingswood, NJ, Sunday, Oct 27, at the Scottish Rite Auditorium for the last US show this year! Tickets are available in person at the venue box office, by phoning the venue at (856) 270-6656, or online through http://www.ticketmaster.com/event/02004ACE96E98BB1. We'd love to see you there!